Ergo-Tweez® tweezers are ergonomically enhanced featuring a foam cushion grip to reduce hand fatigue from gripping. They also provide ESD safe properties and protect the user from heat when soldering. The curved tip provides easier access and added visibility. 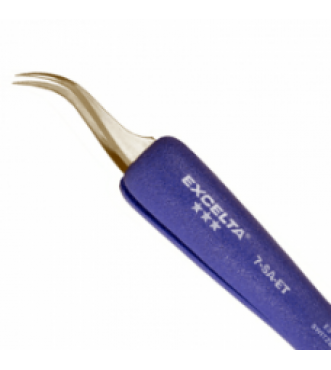 The 7-SA-ET curved tapered very fine point tweezer is ideal for microscopy. 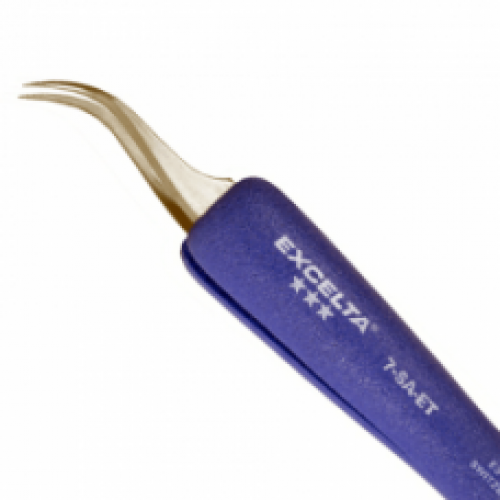 The 7-SA-ET is ergonomic tweezer made of a Neverrust® stainless steel and is anti-magnetic and corrosion resistant. The body is .04" in thickness for light pressure use. The tips are radius which eliminates marring and scratching of delicate parts and wires. It features Ergo-Tweeze® soft cushioned ESD safe (10¹⁰ ohms/sq) ergonomic grips. This curved precision point tweezer allows maximum visibility under magnified applications. The overall length is 5".